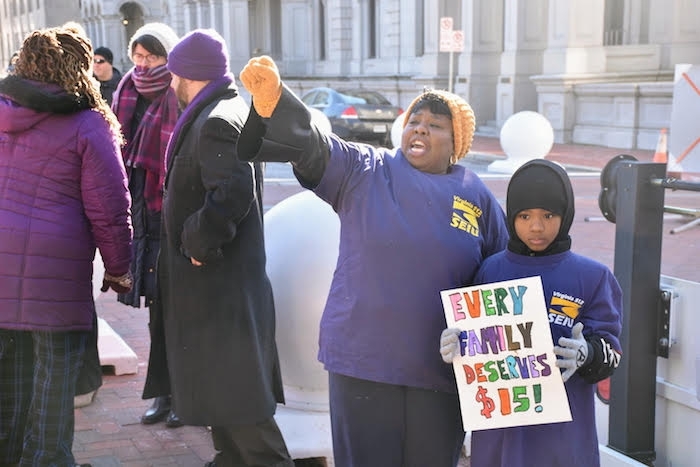 Activists lobbying for a $15-an-hour minimum wage rally outside the capital. Virginia’s largest lobby day of the year also happened to be one of its coldest. But yesterday’s hand-numbing chill didn’t stop thousands of people from descending on the state capital to rally around a potpourri of causes and meet their lawmaker. It’s a spectacle that former Republican delegate Chris Saxman doesn’t miss. Saxman, who now heads a pro-business group called Virginia Free, says the meetings on MLK Jr. Day happen after most lawmakers have already made up their minds. Both voters and lawmakers are adjusting to a new reality when it comes to advocacy and lawmaking. Technological advances now allow ordinary citizens to stream meetings or track bills. It’s never been easier to find a rally on Facebook or send off an angry email to a delegate. At the same time, there’s been an 18% increase in the number of businesses and other special interests registered to lobby in Virginia over the last ten years. All of that adds up to more people vying for lawmakers’ limited attention. The Richmond-based firm Muster is one vehicle lobbyists are using to try to break through the noise. It allows those groups to use their member lists run campaigns with targeted emails and phone calls to lawmakers. The company’s president, Alex Schettine, says tracks the results for its clients, who often use it to make their case for lawmakers. “You have to catch people quickly or you’re not going to catch them all,” Schettine said. Schettine points to one trade group that recently flooded lawmakers on a committee with 18,000 emails in three days. Lawmakers ultimately decided to delay passing the bill the group found objectionable. While this technology has been a part of national advocacy for over a decade, Schettine says an increasing number of his clients are interested in lobbying at state and even city levels, where such campaigns are more likely to have an impact. Other lobbyists say they’ve noticed a broader shift in focus in their clients from national politics to the state level as Congressional deadlock deepens. But some skeptics, like former Democratic Delegate (and current renewable energy consultant) Albert Pollard, wonder if lawmakers are overwhelmed by all of the attention. No one denies that professional, so-called shoe leather lobbyists continue to play a central role in the General Assembly. Lawmakers often lean on special interest groups to draft legislation and even talking points--a practice lobbyists say is necessary given the breadth of topics covered over session. The Richmond-based startup CrowdLobby is founded on the premise that those in-person lobbying campaigns are effective, but inaccessible to anyone without lots of cash. The site is designed to allow people to fundraise to hire a lobbyist. It’s a bit like GoFundMe, except you’re fundraising for a lobbyist who will advocate for the decriminalization of marijuana. Heidi Drauschak, who co-founded the site, said $50,000 can buy a lot in Virginia. CrowdLobby has been slow to catch on since it’s June launch in Richmond. Backers of marijuana decriminalization, for example, have only raised about $1,000 of their $50,000 goal. But Drauschak thinks lobbying--no matter the form--is here to stay. She believes ordinary people will eventually find a way into what was once an opaque process. Chris Saxman says while that might be true, lobbying and persuasion will always be about relationships--the closer, the better. He remembers an issue he was weighing as a delegate. But this is an election year. With control of the General Assembly hanging in the balance, lawmakers will have extra incentive to lend voters their ears.